In my Kid’s elementary school, the Kindergarten teachers now assign the building of a “Leprechaun Trap”. Lots of thought and effort goes in to these traps. Sometimes the kids even get to be involved…. (dads…. gotta love ’em). These sweet little cookies are less than a bite size, so they are perfectly sized for Leprechauns (and little kids). Simple ingredients, simple instructions, you can easily make them with your kids… or in your classroom…. and have them ready to eat in under an hour. Total Time: 1 hour until cool enough to eat. Catch yourself a Leprechaun, or treat yourself to a sweet little treat. Flour, Sugar, Butter, and some Green Sprinkles are all you need to make these cookies. I cut them with a pizza cutter… makes it easy and fast to create the small squares… and a pizza cutter is safe for my daughter to use, and she does love to help. Generally we cut them about 1 cm square (but I’m not using a ruler… so, some might be a little oddly shaped… those can be eaten by the baker). These delicious Shortbread cookies are studded with green sprinkles to celebrate St Patrick’s day…or any day you want a mini-cookie. (BTW…if you want to make these for Christmas Elves…use different colored sprinkles). Prepare baking sheet by covering it with a sheet of Parchment Paper. Cream the Butter and Sugar together in a mixer…let it mix 4 minutes, until light and fluffy. Add the flour, just a bit at a time, until completely blended. Add the sprinkles…beat until they are totally mixed in. Sprinkle a bit of flour on the counter (or work surface). Turn the dough out onto the flour, and knead it a few times until it’s smooth. (We’re not making bread here…just smoothing things out). Move the dough onto the parchment covered cookie sheet. Use a rolling pin to roll the dough flat. You want it to end up about 3/4 cm thick. Now… this isn’t brain surgery, so don’t go hauling out a ruler… just make sure it’s not thin. You shouldn’t need to put muscle into this… the dough is soft…if you press too hard, the dough will become one with the parchment paper, and you will have a mess. It will end up around 8 inches wide by 12 inches long. More or less (I said, put the ruler away). Get out your pizza cutter (yes, you can use a knife). Cut strips 1 cm apart… then go crosswise… 1 cm apart (we’ve talked about the ruler repeatedly… leave it). You don’t have to spread the strips. Let the cookies cool on the baking sheet for 2 minutes… then get out the pizza cutter (or knife) and cut along the lines you cut before. Now you can spread them apart, and let them cool completely. Got Your Cookie Sheet Covered with Parchment Paper? Get Your Kids to Help! 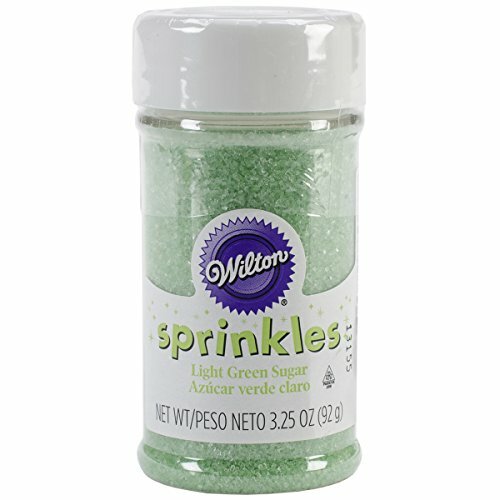 or any day that needs green sprinkles…. Tiny sprinkle filled shortbread bites, perfect for Leprechauns, Kids, and anyone who loves cookies. Fantastic with tea or cocoa. These cookies are super easy to make, and require few ingredients. previous Best Butterscotch Chip Cookies- Chocolate of Course!